Eunice Mosley knows what it’s like to work on the rig floor. The father, husband and Louisiana native is a Floorhand on Trinidad Rig 109 in Texas and has been in the drilling game for almost eight years. 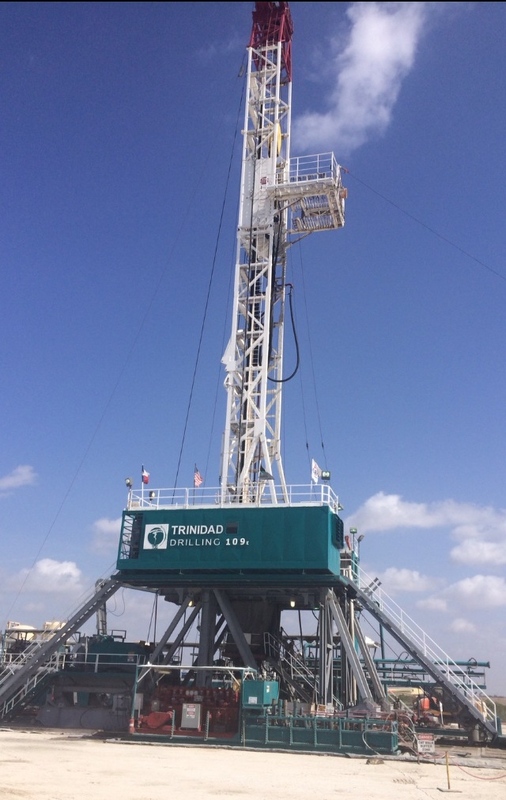 Trinidad Rig 109 in Texas. Photo courtesy of Eunice Mosley. On many rigs, Leasehand is the entry-level job. When you get your first promotion, you’ll become a Floorhand. All the positions on a rig share one important responsibility: Look out for the safety of your fellow crew members. Mosley’s rig has drilled for close to five years without a recordable incident. Why? Mosley said this achievement has a lot to do with Trinidad’s safety initiatives. One of those initiatives is the “Look-out” program, which teaches crew members to look for, stop and report unsafe activities. The program empowers Trinidad employees to stop unsafe practices and get a commitment from the person doing the task incorrectly that they will perform the job safely in the future. Interested in learning more about job opportunities with Trinidad Drilling? Visit our careers page. Want to learn more about other positions on a rig? Check out our “A day in the life of a rig worker” series. ← Drilling down: What’s it really like to be a Motorhand?